Ensure your role as a trustee is effective and enjoyable. To give you information and build up your confidence to ensure your role as a trustee is effective and enjoyable. Anyone who is new to being a trustee or is considering becoming a trustee. Anyone who has been a trustee for some time but would like a refresher. To book a place simply click the ‘Register Now’ button that appears at the bottom of this page. You will immediately receive an email to confirm your booking on the course and an invoice will be issued. If there is high demand for a course we may not be able to accept all members of multiple bookings so that as many organisations as possible can access the training. If this is the case, you will be contacted by a member of staff at least a week before the course date. A cancellation fee will be charged for non-attendance or cancellations. Details of cancellation fees can be found here. If you have any difficulties, please contact the Admin Team on 0161 787 7795. 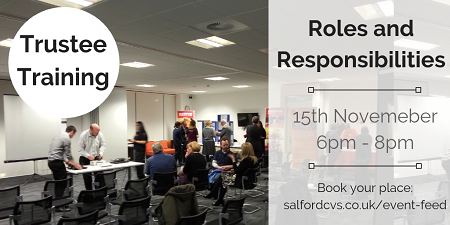 Experienced trainers from the Salford CVS development team and senior management team will deliver this course. A certificate of attendance will be awarded to each course participant on completion of all appropriate paperwork.